Thomas Harman, CEO of Balsam Hill Artificial Christmas Trees, proved last year that True Needle™ technology is the best way to create realistic artificial Christmas trees. The realistic look of the Balsam Hill trees earned kudos from the Wall Street Journal, NBC’s Today Show and Good Housekeeping. This year, Balsam Hill looks to keep the buzz going by introducing the Fifth Avenue Flatback Christmas tree, the first True Needle™ tree with a space-saving, slim design. Priced at $399, Christmas tree stands seven feet tall with 400 lights and 1536 premium branch tips. More importantly, its half-back tree shape allows it to rest right up against any wall, saving floor space in narrow areas or tight spaces. While it’s too early to tell if the new half Christmas tree will be a hit, it’s likely that demand will continue to grow. Artificial Christmas tree sales showed a 10% growth year over year in the past five years, according to the National Christmas Tree Association, with U.S. consumers purchasing 9.2 million artificial Christmas trees in that time. With the reusable nature of artificial trees, the market is likely to see even more people turning to them to celebrate the holidays as environmental concerns grow. Credit: Jennifer Faulkner Balsam Hill’s mission is to create the most realistic artificial Christmas trees, Christmas wreaths and Christmas garlands ever produced. With over 20 different styles of pre-lit Christmas trees, pre-lit Christmas wreaths, and pre-lit Christmas garlands, Balsam Hill strives to offer a high quality product to satisfy any holiday style. 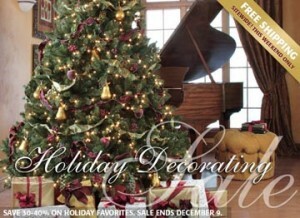 To learn more about all our trees including our new slim Christmas trees, visit www.balsamhill.com. Babylon Productions Wedding Centre brings forth spectacular wedding packages for you to win. Anyone is eligible to win the 2009 wedding services package. Each six months, a fortunate couple will be selected and have their wedding services package completely refunded as a wedding gift from the great Babylon Production. A winner will be announced and Babylon Production will refund the couple the whole expenditure for the wedding package. Aspiring couples can enter the draw and win quality wedding services from this great offer by Babylon Productions. Our wedding services include photography, Videography, Limo services, DJ services, Entertainment, Invitations and Bridal Shop services. For winter and fall specials, contact Babylon Productions and get year-long discounts for wedding services. Babylon Productions presents a range of photography and videography packages suiting each budget. Whether a couple wants to hold a Small Wedding Ceremony for $1 199 or hold a magnificent VIP ceremony for $4 999, Babylon Production is ready to offer services meeting your needs. For the lovers of customized packages, there is a variety of customized packages to suit particular needs. Clients can opt to select photography or videography services separately or have them integrated with DJing making a great combination for a wedding. Babylon Production makes use of advanced and sophisticated sound and photographic equipment to capture carefully the special moments for your wedding. Clients can even opt to have a DVD slide show, which offers an amazing package of the complete wedding activities on one disc. If located in Ontario and any other neighbouring states, Babylon Production is glad to offer you great wedding services. If located further away from Ontario, you need not worry because we take pleasure in getting out of Ontario just to give you wedding services. With Ontario’s fresh air, bright stars and slow pace, we find pleasure in travelling and seeing what the great Ontario province has to offer. If planning a wedding, call Babylon Productions and explain all your wedding plans. Challenge us and see how well we will satisfy all your wedding needs. Our main service area is Northern and Southern Ontario. However, clients located far away from the Great Toronto Area should note that there are associated fair travel costs to be considered if we travel to your location. Babylon Productions Wedding Center website features a strikingly well laid out design, with all the features that make good websites great. It is greatly informative and looks great too! Their packages include a bridal shop, an invitations how-to page, an entertainment hub, a disc jockey page, a page dedicated to limo services, a video and photo page, as well as videography and photography pages. In addition to these packages offered by the site, it offers lots of information about the company, its history and services, a gallery of photos of past weddings they have been hired for, testimonials from happy and satisfied past clients, and a forums page for users to interact about the services offered or weddings in general. Further pages on this fantastic site include a free quotes page, a page for making bookings for any of their wedding services, and a page solely listing and explaining their suite of services. This helpful home page also offers links to partner sites, a directory of services attached to video Babylon and a contact page, in case of any queries from prospective clients. The special offers offered by video Babylon include winter and fall specials. These are offered towards any limo and wedding package booked with them during this period, as well as the already running year round discounts. Offered as well is one free extra limo hour, for any wedding booking made for the year 2009. This free offer is applicable any package that includes a wedding limo before February the 1st, with the disclaimer that the extra hour can be redeemed either for the pickup that occurs late in the night or any time during the day. Featuring a wide and all inclusive tips category, this catalogs any and all wedding tips, from way before the ceremony to after the glorious occasion. These tips include photo and video tips, wedding planning advice, reception planning ideas, limousine tips and wedding destinations, amongst others. They very helpfully offer free quotes on any of their packages, including the whole range of photography, DJs, videography, limos, wedding lights and sounds, amongst other services offered by this company. Babylon Commercial Photography and Video Services include portrait photography, aerial photography, industrial photography, wedding photography and excellent video productions. For the lovers of printed photos, we offer canvas printing photo services. This can be a perfect wedding for a couple, imagine having a couple’s wedding memories obtained from photos printed on a TreasureKnit color photo blanket. Photographs are weaved directly into photo blankets that are snugly and full of great colors bringing forth a perfectly woven image. Slideshow video DVD/CD editing and production services are also offered. We develop a wedding video to our clients’ liking and additionally create slideshows for that great wedding experience. Slideshows present a very simple way for protecting priceless wedding memories. We also offer DVD/CD Printing and Duplication services. For unparalleled DVD and CD replication services inclusive of custom packaging and printing, Babylon Productions has plenty to offer. Are you searching for the best wedding invitation services? We offer tips for planning your wedding invitations and even budget for the invitations. It is very possible to come up with an inexpensive and unique personal invitation. A wedding invitation gives the foremost wedding glimpse to your guests. Invitations offer a perfect chance for toning and styling your big wedding event. With various technological advancements in printing and design, creating custom wedding invitations is a great idea and possibility. Clients can change the invitation as much as they want to make it suit their needs. Clients need to select the theme, paper style, font type, color and tone of their invitation. The perfect paper styles we offer include Vellum, Laid White, Strathmore Natural White, Deluxe Parchment and Strathmore White. We also add a personal touch to the invitation by incorporating pressed flowers, a CD, poems, confetti, ribbons or photos to the invitation. Picture yourself in a spectacular Excursion SUV, Lincoln Stretch or even a Convertible Bentley on your great wedding day. Babylon Production offers you excellent Wedding Limousine Services for all budgets and requirements. Whether a couple needs a shuttle, limo, luxury car or a 35 people wedding Party shuttle, we meet all your needs. Experience the excellent service offered by our drivers and treat yourself with our magnificent limousine services. We offer three main limousine services packages namely Silver Wedding packages, Gold Wedding Packages and Relax Wedding Packages. The Silver Package offers you complete 5 hours of devoted Limo and Limousine driver for your wedding limo. For a devoted Limo and Limousine driver with an additional night trip back home after an epic wedding, the Golden wedding package is a perfect choice. For the lovers of crème de le crème, the Relax wedding packages awaits for you. It offers you 12 hours of dedicated driver and car time. Clients can even opt to select 10 hours of dedicated Limo and Limousine driver time with an additional late night delivery. Additionally, we offer night out, and prom night limousine services. With Babylon Production DJ Services, you will have the best wedding entertainment ever. Choosing an appropriate wedding DJ plays a critical role in making your wedding a great success. Get a DJ that will accentuate the wedding’s overall mood and at the same time satisfy each entertainment need of your guests by selecting the Babylon Productions DJ package. With the latest entertainment equipment and great experience in entertainment using digital or wireless systems, our DJs offer you great entertainment. They have a great collection of wedding songs and perfect sound and light configuration. Since 1981, Babylon Productions has offered clients the ultimate music entertainment and guarantees to keep your guests on their feet. We customize the music for your wedding, dancing and reception pleasure. From high-energy songs to love ballads, you and your guests will get entertained with non-stop music. Babylon is glad to offer spectacular experiences for all your wedding entertainment needs. Our skilled DJs cater for a wide range of musical genres, events and styles. Our Bridal Shop Services will enable you select an appropriate wedding dress, wedding cake, wedding invitation, wedding favor and accessories. Whether planning a lavish and large or simple and small wedding ceremony, enter the draw for the Babylon Productions’ 2009 wedding services package. You could win a comprehensive wedding services package and all your wedding needs will be catered for letting you enjoy your wedding ceremony without hassles and worry. We will offer individual attention to you and your clients giving you the unique event of which you have always dreamt. If you are searching for a professional wedding services in the Toronto, Mississauga, Vaughan, Markham, Ontario area who for newborn Weddings, Limousine, Dj, Video Productions, Photographers, Video, portraits, children’s portraits, family portraits and lifestyle photography in Oakwood, Downsview, North York, Weston, Willowdale, Etobicoke, Fisherville, Thornhill, Concord, Scarborough, Woodbridge, Maple, Vaughan, Richmond Hill, King City, Ancaster, Hamilton, Burlington, Mount Hope, Stoney Creek, Brantfod, Guelph, Kitchener, Waterdown, Milton, Dundas, Caldonia, Grimsby, Kleinburg, Locust Hill, Brampton, Gormley, Springbrook, Whitevale, King City, Oakville, Pickering, Ajax, Durham Region, Wasaga Beach, London, Ontario, Stouffville, Bolton, Paris, Niagara or GTA please contact Tobi to set up a session, where the focus is on you.